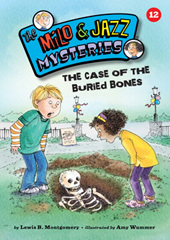 Milo and Jazz team up to solve their very first mystery! The Wildcats’ star pitcher is missing his lucky socks, and his pitching is going to pieces. Milo and Jazz have to find the thief—and the socks—before the big game! Buy online from Better World Books - support literacy and libraries! Who would want to harm an adorable pet piglet? It’s up to Milo and Jazz to find out the identity of the mysterious pig poisoner. And there’s no time to lose! A ghost? At school? Detective duo Milo and Jazz have their hands full when they find out their class’s “haunted house” might really be haunted! There’s a psychic in town—a pet psychic! But is the Amazing Zelda really as amazing as she seems? Milo and Jazz are on the case! It's the Fourth of July fair! There are fireworks, parades, pies, games . . . and a jinx? When everything starts going wrong, Milo and Jazz must find out: is it really a jinx--or is it sabotage? Milo’s team is losing the camp color war. But their awesome moose mascot could help them pull off a win. That is, until it mysteriously disappears. Can Milo and Jazz crack the case? How can a pool suddenly turn purple? And who could be behind it? 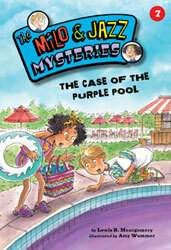 Detective duo Milo and Jazz make a splash as they investigate their most colorful case yet! A jewelry store is robbed. 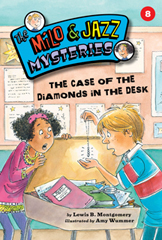 A diamond necklace mysteriously shows up in Milo’s desk at school. The connection is crystal clear...isn’t it? 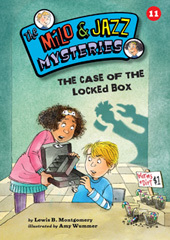 Detective duo Milo and Jazz tackle their eighth case in this exciting mystery! Campaign mania hits Westview when Jazz decides to run for school president. But is someone stealing all her best ideas? And how? 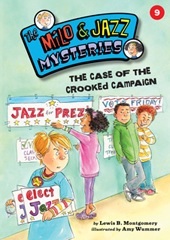 Milo and Jazz must solve the mystery—before Election Day! Starr Silveira's hit TV show, Super Starr, is filming in Westview! 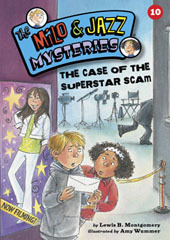 But when kids receive letters from "Starr" asking them to hand over valuable show memorabilia, Milo and Jazz suspect one thing: a super scam! Someone stole 100 dollars from a locked cashbox...and almost everyone in school thinks that the culprit is Jazz! When Jazz is put on trial in student court, it's up to Milo to prove her not guilty! When it's time to dig up the town time capsule, all that is found is a mysterious note...and a skeleton! To everyone's relief, "Herman" turns out to be the long-lost skeleton from the high school science lab. Can Milo and Jazz gather enough clues to find the missing capsule and solve a 75-year-old mystery?